Though there are several occurrences of frivolous lawsuits in recent years, a slip and fall injury can be a serious matter. If you have slipped and fallen due to someone else’s negligence and suffered injuries, you have a legitimate reason to sue the offending party. By pursuing a lawsuit you may get help covering unexpected expenses, loss of wages, and other costs associated with personal injury. When you sustain an injury, it can be incredibly stressful; you shouldn’t have to worry about how you’re going to pay your bills and look after your family on top of everything else. Luckily, a Pompano Beach premises liability attorney can help. When you file a slip and fall injury case, you must prove that a dangerous condition existed at the scene of the fall. Some of the more obvious dangers include broken stairs or a loose railing. A less obvious condition might be poor lighting, especially if your accident occurred sometime in the evening or negligence in cleaning up a spill within a reasonable amount of time. If you want to seek damages, you must be able to prove that the individual or entity in charge of the property on which your accident occurred knew about the dangerous conditions before your accident happened. If the individual or entity knew of the dangerous conditions and did not fix them, or warn people of the conditions, then you will have a strong case. Take note of the surroundings where your accident occurred and be sure to document if there were no signs on sight. Signage or the lack of signage is one of the first things that make or break your case. 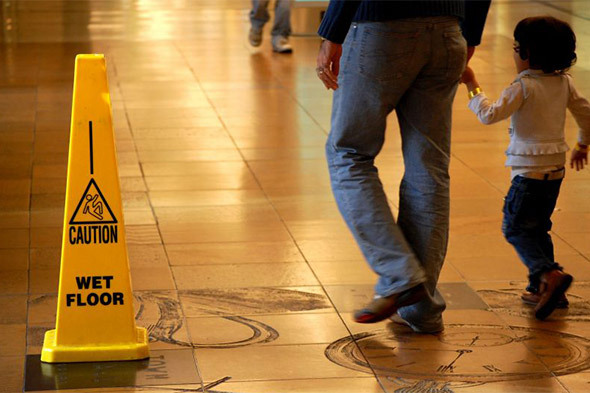 If you note that an employee was mopping without putting up barriers or warning signs and left the floor unattended for a certain amount of time your premises attorney will able to determine if you have a case; particularly if you have supporting images, video, or similar evidence of the negligent behavior. Lastly, you must prove that an injury did indeed occur because the possessor failed to repair or address the condition or post an adequate warning signs. Aside from slip and fall injuries, we also represent clients who have sustained injuries from car and motorcycle accidents, as well as those who have construction site injuries or traumatic brain injuries. If you’re ever in need of a Pompano Beach motorcycle accident lawyer, you can count on us. If you sustained injuries on someone else’s property and believe that his or her negligence is to blame, we can provide you with an experienced Pompano Beach premises liability attorney. At Bell & Bell, P.A., we help slip and fall victims throughout south Florida. If you’ve been injured in a slip and fall accident, call us today at (954) 783-2215, and read on for four facts that you’ll need to prove when seeking damages. When you sustain an injury, it can be incredibly stressful. Luckily, a Pompano Beach premises liability attorney can help prove 4 facts about your case.